English Toy Spaniels are the ultimate lap dogs, as they love to sit by their owners' side. They are sweet, shy, easygoing and affectionate to their owners and those they are familiar with. They make a wonderful companion for the elderly.This breed is a small, sturdy, square breed with a deep, pug nose that is black with very well open nostrils, a well-defined stop, and dome-shaped skull. The teeth should be slightly undershot. The have large, dark round eyes with a sweet expression. Their soft, silky coat is well feathered and comes in four colors varieties: King Charles (black & tan), Ruby (solid red, sometimes with a few white hairs or small white patch on the chest), Blenheim (white with red markings, often with a red "thumb print" centered on the top of the head), and Prince Charles (tri-color: white with black & tan markings). The tail is customarily docked. The English Toy Spaniel is playful, sweet, gentle, happy and loving, but it is sometimes timid. He/she will be sociable with those who approach it affectionately. They are friendly with other dogs. 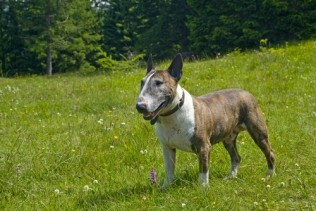 This breed is naturally well-behaved and intelligent, but is a bit willful. It's quiet, non-demanding, and needs to be treated gently. This little dog needs to be with a lot of people to be happy. They are usually good with all children, but will do best with an older child. They are, however, considered exclusively a companion dog. Some are known to be picky eaters. Patellar luxation, cataracts, inguinal or umbilical hernias, and heart murmurs. The English Toy Spaniel will benefit from any amount of exercise, they are very low-key. Training is easy as they are intelligent and quickly grasp what you are expecting of them. They are eager to please.